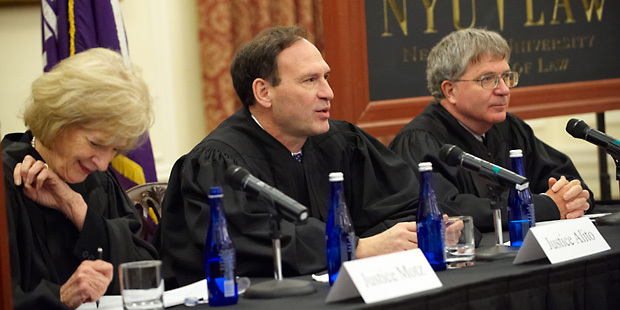 Justice Samuel Alito presides over the 37th Annual Marden Competition. Nothing gives a mock supreme Court hearing a frisson of verisimilitude like the presence of an actual Supreme Court justice. 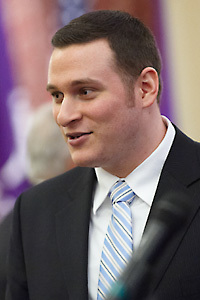 On April 8, a standing-room-only crowd witnessed Justice Samuel A. Alito Jr. and U.S. Court of Appeals judges Michael W. McConnell of the Tenth Circuit and Diana Gribbon Motz of the Fourth Circuit presiding over the 37th annual Orison S. Marden Moot Court Competition. In the fictitious case Veruca Salt v. United States, created by Roxana Labatt ’10 and Kate Corbett Malloy ’10, the petitioner appealed her conviction for attempting to smuggle piñatas filled with oxycodone into the country. She argued that the government had violated her Fifth Amendment rights by introducing as evidence of guilt Salt’s silence prior to her arrest and the reading of her Miranda rights. She also asserted that the Constitution’s ex post facto clause had been violated when the district court judge looked to a newer version of the federal sentencing guidelines that recommended a longer sentence, rather than the guidelines in place at the time of Salt’s offense. These were thorny questions that, as McConnell pointed out, were “pitched at pressure points within the Supreme Court’s jurisprudence.” Both the petitioner’s counsel, Daniel Weinstein ’09 and Vikram Kumar ’10, and the respondent’s counsel, Matthew Lafargue ’10 and Beth George ’10, faced a barrage of challenging queries from the panel of judges.